With the official album tour party at Sankeys, Manchester now just over a week away, now seemed like the best time for our Nicola McDougall to give her thoughts on Eddie’s album for Toolroom Records... I’m intrigued. Eddie Halliwell releasing a house album without the word ‘hard’ in front of it. This has got to be worth a listen surely! 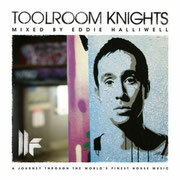 So, in search of some sun I decide to take ‘Toolroom Knights Mixed By Eddie Halliwell’ to Ibiza with me on a pre-season jaunt to the White Isle and clearly this album is going to be a forerunner for this season’s madness as the billboards already have appeared plastered with his Toolroom night artwork. The album starts off with a nice and gentle intro in the shape of a sweet offering from Digitalism, ‘Circles’, and moves into the more melodic Eddie’s Edit of Morgan Page, Sultan, Ned Shepard & BT ‘In The Air’. The vocals from Angela McCluskey on this track are classically beautiful, almost trancey and there’s certainly room for a bit of sing-a-long. Included in the album is without a doubt one of the best remixes I have ever heard of Florence and the Machine’s ‘You Got The Love’. Although it’s been out for months, Mark Knight has managed to take this track and really turn it into something even more special than the original and certainly a cut above the other remixes that were released. It’s well worth a listen just for this track alone. Keeping ahead of the game, the further offering from Mark Knight and Funkagenda in the form of ‘Antidote’ is just sublime. A beautifully presented piece of music I’d kill to hear played in a club and watch the goose bumps as it reverberates around the room. Spine tingling stuff! I’m absolutely in love with Eddie’s remix of the Trisco track ‘Musak’, which originally featured on my favourite movie ‘It’s All Gone Pete Tong’. I love the take on this track, as it brings a fresher, funkier feel to it - I can’t quite make it to the next track because I keep putting this one on repeat. In the mix is also ‘Bang Bang’ by LA Fuente (Eddie’s Edit), where you get to sample some of that scratching that we all know and love from Eddie. Towards the end of the album it’s positively buzzing, it’s gone way past house and into a deep and dirty electro tinged party. Nicky Romero’s ‘Generation 303 (Eddie’s Edit) is going to get some caning in Ibiza this season I can tell you! Is this house? I don’t know. I like the fact the album has not been defined by its name. There’s a bit of trance like house, banging house, verging on hard house and it’s played in my house! Loud! This is a seriously wicked offering from Eddie, something for everyone at any stage in their musical journey and it’s the kind of album that will stay in my music collection for many years. Album launch-party info below.